Vice-President of the Yacht Racing Association. He presided over the 1906 Conference in connection with the international rating rule, and his success as Chairman on that occasion was conspicuous. He was born in London in November, 1839, and educated at Blackheath and King’s College. Eclipse, Length-Class 30-Footer. Mr. Augustus G. S. Manning. He commenced yachting in 1856, and two years later built the Monk, 6-ton cruiser. Subse­quently he owned the racing cutters Pewit, Elaine, Eclipse, Gamma, Venilia, Ada, and the s.s. yachts Catherine and Gazelle. At the present time he owns the Aid, an auxiliary motor ketch, and the Ida. 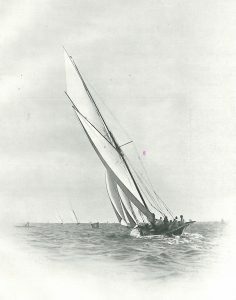 Eclipse was a cutter designed by C. P. Clayton for the 30-foot (water-line) Southampton length class, and was one of the most remarkable yachts built under that system of measurement. She carried 2,080 feet of canvas, and in 1884, in a class of five boats, she started in twenty races and won first prize in every race. Gamma, 3-tonner, also had an undefeated record in the year that she was built, and was sold and sent to Wellington, New Zealand, where she had a very successful career. Clubs: Royal Thames, Royal London, New Thames, Royal Portsmouth Corinthian, Bembridge Sailing, and Thames Sailing. Residences: 26, Grosvenor Place, S.W. ; and Chilworth Court, Romsey, Hants.